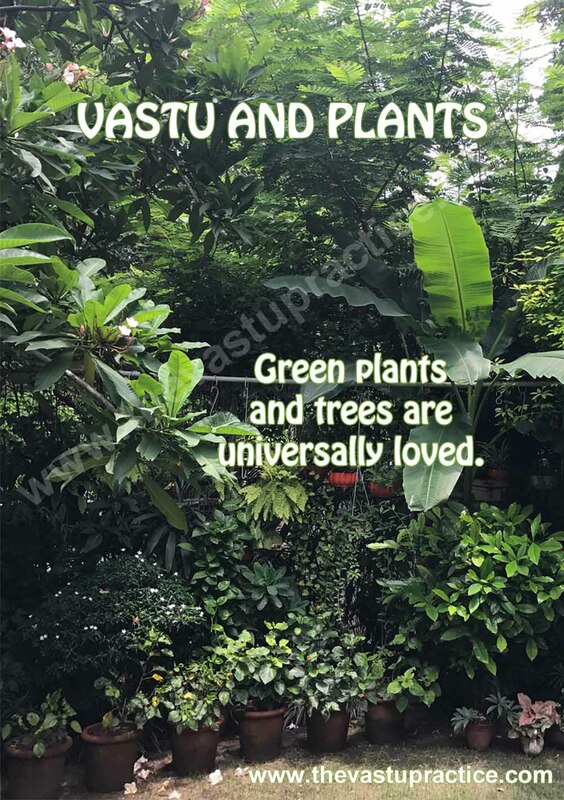 Green plants and trees are universally loved. They look beautiful and also have a calming effect on the mind of the residents. Plants and trees play a pivotal role in energizing the atmosphere.They help to neutralize the excessive effects of electromagnetic fields caused by electrical appliances, computers and cellphones and cleanse stagnant energy because they are in a dynamic condition of growth. Trees should not be grown in the North, East or North East. Small, decorative plants and shrubs, lawns and flower beds can be grown in this area. Most importantly, holy basil (tulsi) should be grown in the North East zone. A large tree opposite the main door is not auspicious. All thorny plants and trees like lemon, gooseberry, tamarind and all cactii and those that exude white sap like banyan, papaya etc should not be planted within the compound of the house. Adverse effects include financial crisis and mental tension. Rose is the only thorny plant which can be grown in the house preferably in the North-West zone. Mango tree represents Venus which rules the South East. So any problem in the South East can be rectified by planting a mango tree in this zone. Audumber traditionally represents Guru Tatwa (gravitational force). Thus it is very beneficial to plant it in the South West because it results in holistic positivity. Christmas tree has a pyramidical shape and can be said to be a living pyramid. Thus it is also a very beneficial tree to be planted in the South and South-West. Aromatic fragrant plants can be planted in the North West to give fresh dimension to the wind element. Moving water attracts positive energy and encourages prosperity. A fountain or a small pond with fish in the North-east zone of the plot is very beneficial.